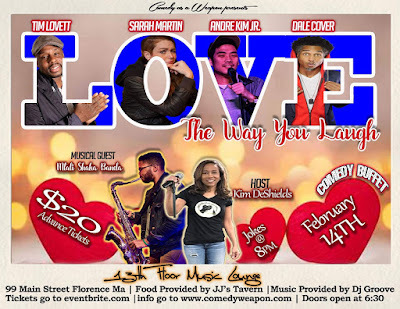 February 14th at the 13th Floor Music lounge we bring you some of the funniest comedians along with some of the most delicious food you ever tasted. 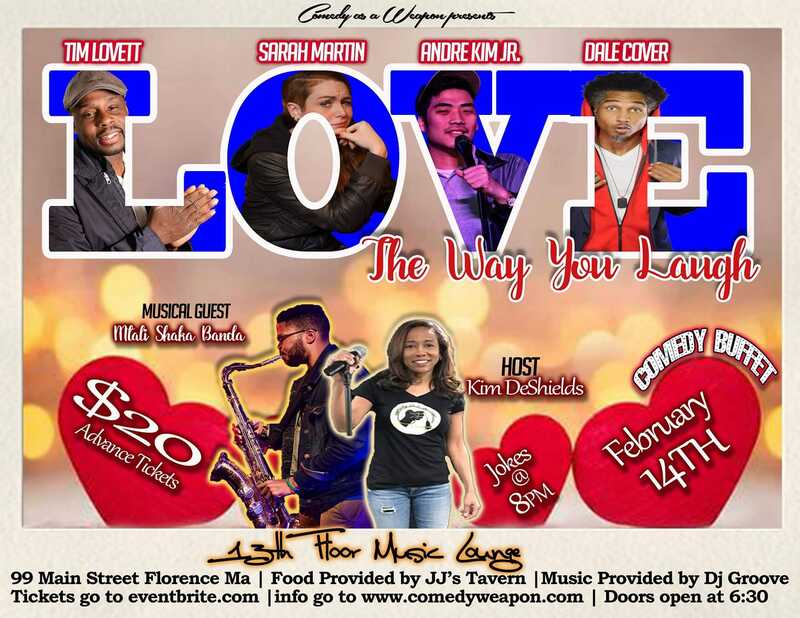 So bring your Boo or Bae, your wife or hubbie, or that special friend as we do Valentine’s Day Comedy as a Weapon style. First, start off the night by enjoying invigorating cocktails at the newly remodeled lounge area. Tonight, let us cook for you as we provide an arrangement mouthwatering food buffet style prepared by JJ’s Tavern (menu provided on website). Bring your appetites, and treat yourself while Dj Groove of Good grove entertainment make you hum love songs. We kick off the entertainment with the smooth and sultry sounds of Sax man Mtali Shaka Banda and his band. After his grown and “saxy” set we get seriously funny with an array of the hottest traveling comedians on the east coast starting with host Kim “Boney” DeShields (Nick at Nite). On the menu we have Tim Lovett (opened for Donnell Rawlings), Andre Kim Jr. (NBC & Iheartradio), Sarah Martin (Sirius XM Dog Radio), and headlining this evening is Dale Cover (What the Deal Dale Podcast, Main Comedy Festival). Dale Cover- Has performed stand up on the finest stages including Comix, Levity, Gotham, Dangerfields, Rhodehouse Live and is a regular comic with Funny 4 Funds. He is also a writer and producer of some of the funniest content around.